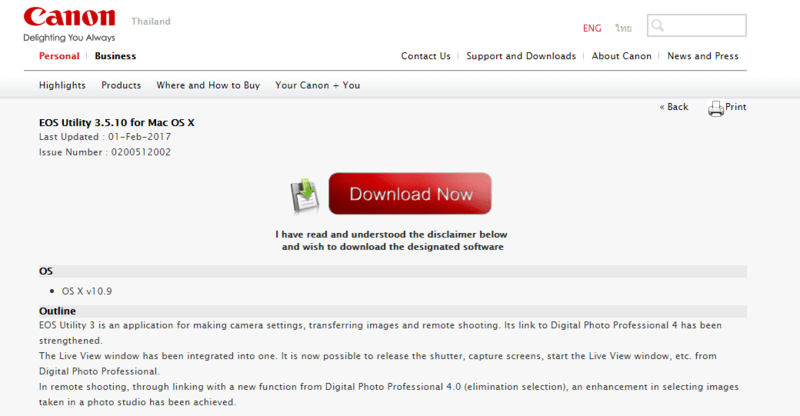 EOS Utility 3.5.10 is software application that makes for camera setting, transfer image and remote shooting. The feature of Live View Window in this software has been integrated become one. With this software, there are several enhancements that able to enjoy such as release the shutter, start the Live View window, and capture screen from Digital Photo Professional software. Macintosh with OS above installed and USB port as standard feature. Screen resolution: 1.024 X 768 pixel or more. Colors approximately 32000 colors or more. This software is compatible with model EOS M5, EOS REBEL T6, EOS REBEL T6i, EOS REBEL T6s, EOS M10, EOS 80D, EOSM3 , EOS 5D Mark IV, EOS 760 D, EOS 7D Mark II, EOS -1 DC, EOS 5D Mark III, EOS 6D, EOS -1 D mark II, EOS 750 D, EOS Kiss X80, EOS Kiss X8i, EOS 5D SR. This software now is support with EOS M5. Support for camera that uses lenses EF 24-105 mm f/4 L IS II USM, EF16-36mm f/2.8L III USM. Download the “EU 3.5.10 installer.dmg.zip” file from downloaded page. Save the zip file into folder that you have preference into your computer. Double click to the zip file. Decompressed the file and the EU 3.5.10 installer .dmg file will be created. Double click to the EU 3.5.10 installer.dmg file. When file decompressed, the disc image the file EU 3.5.10 will be mounted. Follow any instruction that displayed in the menu. When the installation has been complete, then EOS utility installer may ask for restart your computer. Restart computer. If the installation complete, the file is no longer needed. 0 Response to "EOS Utility 3.5.10 for OS X Mac"